Ola Cabs, the online cab booking and rental services that already offers services in Delhi Mumbai and Bengaluru seem to have launched in Pune as well. They have sent mailers to some users letting them know that Ola Cabs is now operating in Pune (We got to know from tweet published by @akkiman). Ola Cabs differs from other online cab rental companies, due to the fact that they offer seamless GPS tracking services which enables the travelers to see the cabs and their availability in real time on Google maps. Ola Cabs also has an app for Android as well as iOS devices and uses Geo-location services to show location of their cabs in real-time, so a user can actually see them and call for them if they are in urgent need of a cab. Interestingly, I needed to book a cab to travel to Airport a day later, and I tried using Ola Cab app. Unfortunately, it looks like Olacabs does not have too many cars in their fleet in Pune and hence it did not show any cabs in the vicinity of Pune. However, it did allow me to book a ride later and I also got a confirmation number in email letting me know that my cab has been booked at the designated time. I will see if the cab actually arrives tomorrow at the designated time – I sure don’t want to miss my flight! 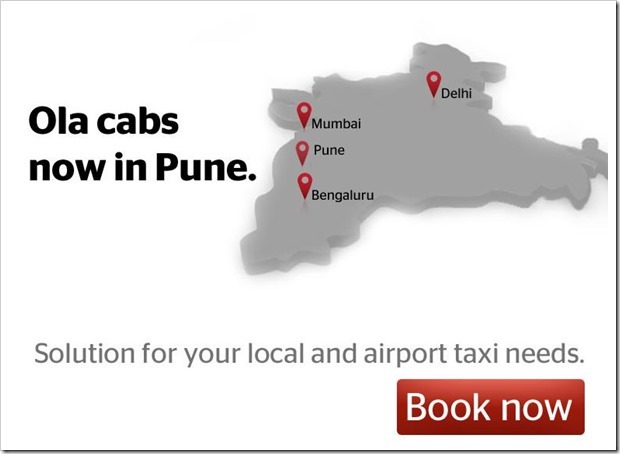 Unlike Bangalore, Delhi or Mumbai, Pune does not have too many online cab booking services. 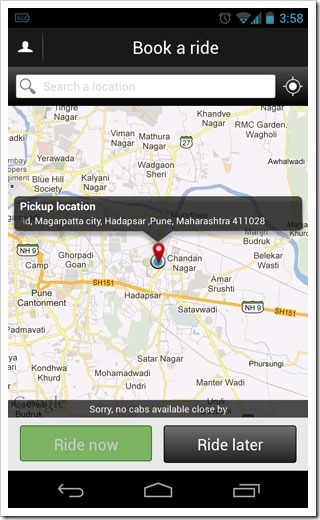 Meru Cabs, Easy Cabs, taxiforsure and many other new online cab booking services have not yet arrived in Pune. Pune has more traditional car rental services like Wings radio cab and traveltime. With arrival of Ola Cabs, it will probably get much easier for travelers who prefer booking cabs on the go or on urgent basis on their smartphones. I have travelled using OLA cabs pune. It’s unreliable. They never reach on time and cancel cabs at last moment. You wont be left with any option to catch flight on time. It better to pay 100 bucks more rather than loosing a 10K flight. When I poseted the review at my working place. around 50 ppl reverted to me with same review. Don’t trust them, they are unprofessional and don’t take responsibility. With the rates which they are giving to vendors and the way they are doing business its just that as soon the foreign funds are over we should see a post saying ola stops are operation in india. car rental business is very unique here in india and its not easy to survive here with but we can are really hoping best for ola. but the way they do business its hard for vendors to hold with them. i think most vendors would join then and leave then in a period of just 45 days – 60 days..